Emily Peiffer, the editor over at Construction Dive, recently posted a feature article titled 10 Construction Trends to Watch in 2017. Since hers is one of the first of 2017, I thought that we would share the list and give you the link so that you can take a deeper dive into the list at your leisure. Here is Emily’s provocative list. Collaborative project delivery methods will become more popular. The labor shortage will continue to plague the industry. The feeling of uncertainty will linger under the new administration. Offsite/modular construction will gain a stronger foothold in the market. Construction firms are cautiously optimistic for a future infrastructure-spending boost. IoT holds the potential to revolutionize the job site. Construction costs will rise due to materials and labor. VR/AR tech will pick up steam. The sustainable construction movement will consider changing its message. Construction firms will face increased scrutiny and prosecution of safety and fraud incidents. Pick any one off the list and you can “riff on it for awhile”. Personally, I think that number two on her list, the skilled labor shortage created by the high number of skilled workers reaching retirement age and the low numbers of Millennials entering the industry will drive the trends and impact each of them in some predictable and some unexpected ways. Skilled labor shortages will drive owners to mandate collaboration in order to get their projects financed and built so that they can get them leased and sold. The low bid approach will still thrive, but many of the institutional owners will drive for faster more collaborative “design-build and IPD” approaches. Skilled labor shortages will drive the modular and off-site construction trends, especially in the healthcare construction wave that is sweeping across the country as a result of the ACA and the Boomers reaching retirement age. The lack of skilled labor and an ever increasing load of “big data” will create the need for more Internet of Things for the field workforce and will create the need to communicate real time data from the office to the field. iPads and tablets are becoming common, but a broader use of robotics and IoT for the systems and parts will make for some exciting times in the industry. The lack of skilled labor will drive building costs up as Emily says, and in order to maintain some type of profit margin, builders will have to turn to other ways to accelerate the construction process. We still see too much waste on the site and we have to find ways to recycle those wastes and minimize them as well. 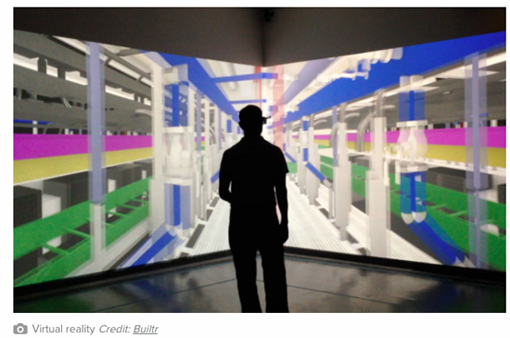 Skilled Labor shortages will force construction companies to use AR/VR for training and for on the site construction. While NASA and other government agencies have used VR for years, the new technologies that are being developed will accelerate their usage. This is one of the ways to recruit Millennials into the industry, and there is no question that they will embrace that technology more rapidly than the Boomers. While we, as an AEC industry, are slow to adapt new technologies and new ways of building, LEED has become commonplace in most of the materials and the structures that we build today. Emily states, “The sustainable construction narrative will change.” We couldn’t agree more. Further, we believe that the new narrative will be that, “This building was built by a sustainable highly skilled craft workforce and that the quality that they delivered will reduce the life cycle costs for the users and owners.” Movements like C3 (Construction Career Collaborative) in Texas, a collaboration of Owners, General and Specialty Contractors will become an integral part of the new narrative and not only will Owners and users demand higher productivity and lower life cycle costs, they will require that those building be built by a trained, skilled, craft workforce that is able to utilize all of the developing materials, technologies, and methodologies that Emily outlines in her post. During the time of transition, safety will become a central focus for enforcement. Today, on many construction sites, owners and GCs have no idea who is working on their projects and whether they are OSHA certified and trained. That will change at an accelerating pace, especially as we see an expanded use of I-9 identification and high tech wearables. 2017 will be another year of change in the political realm, in the global scene, and throughout the construction industry. We are beginning to see trends that hold the potential for long-range positive improvement to the industry. You can take a deeper dive into Emily’s article here.